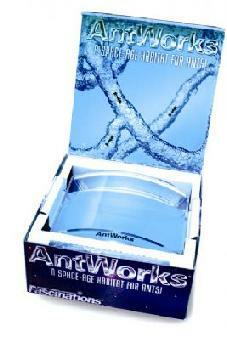 We offer a variety of colors on the antworks habitat here for you to choose from. The Blue Habitat was the original one that Fascinations Toys came out with. Originally this unit did not have an led base but was still a winner in throught the homeschooling and toy circuit . It made learning about Ants and entemology much more interesting as a life science or Foss Teaching product. The Antworks habitat was used by many home school teachers as an educational tool to teach children of all ages. Who said leaning can't be fun. If something is fun it is so much easier to remember. Now after the Basic Nasa Space aged blue gel unit came out I guess a little brainstorming session went on and a lightbulb popped bright inside someones head as they decided to add a light to the Antworks. How cool i know. This cast a cool blue with its 4 DC powered leds and they are bright as you will see from the video below. These make great additions as they can be nightlights for childrens rooms. Don't worry your Live harvester ants won't mind. Well one color was not enough so how about to more illuminated antworks in green and red now fascinations thought? Great idea in my book. The Gel that the live ants eat and drink is this color as well as the led lights that make this glow are the same color. So when picking a Red, Green or a Blue Ant habitat which would make the Best gift for Christmas, any kid ( age appropriate of course) Birthday present or any other special occasion or for just a cool gadget. you have a few options to choose from. Choose wisely!